I grew up encouraged with a variety of adages. One of which comes to mind regarding conservation efforts is, “a good tide raises all ships.” I’m recollecting when I was toting two different slide carousels in the 90’s for group presentations. These were talks I freely gave to visitor center classes and garden clubs. One set of slides was on migratory birds; the other for naturescaping and native plant conservation. A “good tide” being a conservation effort, thus in the environmental field so many nature topics are intimately entwined and can benefit from that single undertaking. Ultimately my two slide set programs and a truckload of educational props benefited each cause. We see this good tide of effort currently in city parks, schools, and backyard practices for monarch butterfly conservation. The monarch butterfly fall migration to Mexico is a true natural phenomenon. When I approached the topic of monarchs in my past naturescaping talks, I would mention their migration would likely be a topic of discussion in my global backpacking trips and fieldwork. People from other countries knew about the multi-generation butterfly journey through World Wildlife Fund and The National Geographic Society and they were absolutely fascinated. I was never asked about other North American wildlife - bald eagles, bears, moose etc. exclusively just monarch butterflies. It peaked my interest, at the time it seemed persons from foreign lands were more engaged than many of my homeland neighbors. Well the tide has changed and today monarch conservation is a hot conservation topic. The butterflies have suffered from human activities in both their over-wintering and summer ranges. The continuing loss of milkweed species has drastically affected the population growth, because these are the host plants needed by the monarch caterpillars. A double blow has been the decline of native flowers as nectar sources for hundreds of pollinators including this scaled-winged migrant. A side note to monarch conservation is the benefit to hundreds of native bee species. These bees are essential for nature’s food-web gardens as well as our own blueberries, strawberries, melons, sunflowers and chili peppers. As with all time spent outdoors the educational value floats the tide especially among the homeschooling families and local private and public schools. The investment may be a small allotment of $25-$30. Native host plants and nectar sources placed in the right setting are hardy and should last for decades. I’m always happy to advise any educator or homeowner on some basic milkweed, blazing star and asters to start a conservation-intended flowerbed. Grownative.org is a teacher/gardener friendly website, easy to navigate a wealth of resources for those interested in landscaping with native plants. Journey North / learner.org gives educators many inquiry-based student lessons for migratory life. S.T.O.M. (Science Teachers of Missouri) is taking the lead for highlighting science in the classroom and curriculum. Their initiatives on integrating science, technology, engineering, and math into the existing curriculum will help our students prepare for higher critical thinking careers. Yes, monarch butterflies are a suitable subject matter for all that and added social studies and geography. Interested conservationists may E-mail me naturescaping or classroom questions to get started. Autumn is a prime time to design a garden and plant perennials. Plus, the monarch passage in our area will likely be the third week of September through mid-October. The Missouri Department of Conservation continues to be a community leader in naturescaping for our region. 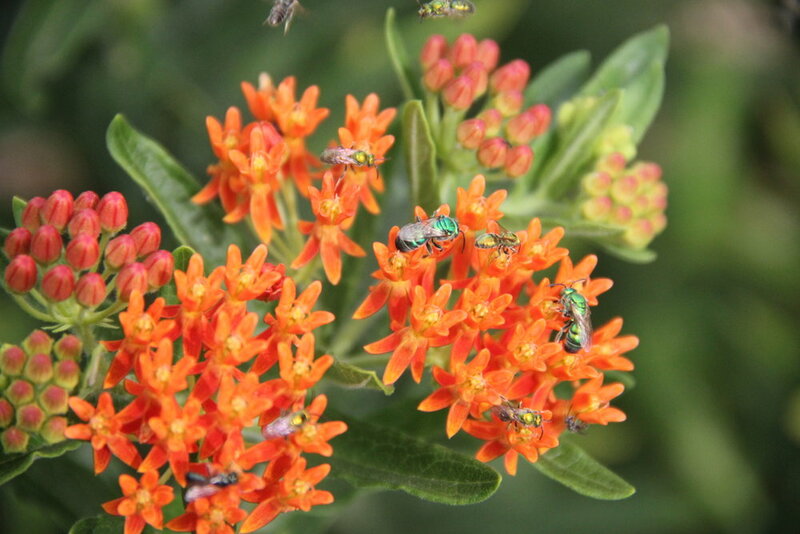 As the upcoming Shoal Creek Conservation Education Center is transforming into the area’s key nature discovery resource, we will be hosting a native plant sale and have staff on-hand for shade garden planning, monarch and hummingbird garden plots etc. The event is Saturday, 22 September, 2018. 9am – noon. Posted on September 17, 2018 by ann butts.